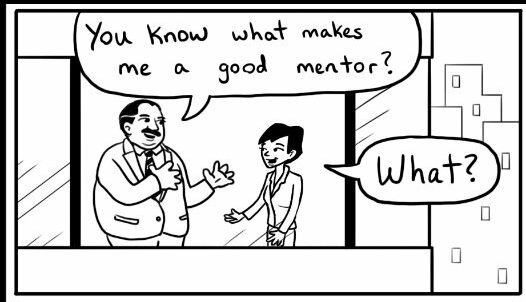 These days, everyone seems to be a startup mentor. Whether they have ever done a startup or not, whether they have ever raised money or not, they are ready to advise entrepreneurs. To those entrepreneurs looking for a mentor who can help you accelerate your business, please keep the above points in mind. You need someone who is willing to tell you what you NEED to hear, not what you WANT to hear. You need to find someone to work with who the experience of building a business, and that includes concrete issues like sales process, positioning, etc. You need to find someone whose primary motivation is NOT to focus on fund raising. That may or may not be what you need. You need someone who has enough judgment to help you figure out whether or not you have a fundable situation, and if so, then how to raise money. Bottom line, I want to share a cartoon that you should keep in mind. On March 31, 2016, 1M/1M will be hosting our 300th free online mentoring roundtable. We started experimenting with this format of mentoring way back in the fall of 2008. At the time, 1M/1M did not exist, not even in our heads. It wasn't until my January 2010 New Year Resolutionthat the concept was born. The 1M/1M premium program was launched at the end of 2010. It took us about one year to figure out how to do what we were hoping to do: help entrepreneurs at scale. Over 40,000 people have participated our free roundtables. At least 2,000 have pitched. Recordings are made publicly available at our YouTube channel. We use the same format in our private roundtables for the premium members, although those recordings are not available except to the members. We've done private sessions every week for the last five years, sometimes multiple times a week. We have been able to develop and enrich a curriculum that entrepreneurs use in web self-service mode over the last five years. The curriculum, increasingly, is able to address questions from the entrepreneurs without the need for interactive sessions. As such, when we do get into interactive discussions, they are on more sophisticated issues. The basics can be handled by the curriculum. Obviously, the feedback is good, or else, we wouldn't be able to continue with such a consistent, long-running effort. In 2016, I feel that it may be useful for entrepreneurs wrestling with growth issues to learn some of the highlights of what we have learnt. First, it is extremely difficult to give negative feedback to entrepreneurs without triggering a defensive reaction. I was not good at this when we started. I am very good at analyzing a business scenario, but I was never good at sugar coating the feedback in a way that is particularly nurturing or reassuring. Very early on in our experiments with online mentoring, we told entrepreneurs that this forum is for candid, constructive feedback, and that may include negative feedback. We don't tell entrepreneurs what they wantto hear. We tell them what they need to hear. While some egos get bruised, entrepreneurs have more or less accepted our approach, and have given us permission to 'critique' their ventures. I have, personally, gotten better at giving feedback in a palatable way. The biggest thing that has worked well is that we never, ever give negative input gratuitously. Everything has been in the spirit of helping both the entrepreneur (s) and the businesses grow. Nonetheless, if through this process I have offended you or hurt your feelings, let me take this opportunity to apologize. It was not my intent. Second, our hypothesis about case-study based learning and mentoring is working very well. Both at the public roundtables and at private roundtables entrepreneurs learn not only from pitching but also from listening to the pitches and interactive discussions with other entrepreneurs. In addition, we have the entire curriculum backed up with case studies, so entrepreneurs are not only getting a piece of input, but seeing that strategy exercised by an entrepreneur who has leveraged it well. Today, we're seeing entrepreneurs making good, solid decisions based on what they're learning from the curriculum and the roundtables without even speaking with anyone. That is really cool! Third, it is a complex exercise to give people a message that goes against the grain of media hype. The entire entrepreneurship and technology media goes wild with deals like SnapChat that is entirely speculative. Entrepreneurs think that they can raise millions and get acquired for billions without a business model. We don't believe that. Our methodology is a bootstrapped, lean, capital-efficient startup methodology that puts a great deal of emphasis on business model and monetization. Speculative stuff is neither what we believe in, nor something we encourage entrepreneurs to pursue. As such, we are unable to get through to folks with the speculative mindset. Fourth, a lot of entrepreneurs are looking for silver bullets. They are not necessarily interested in doing the hard work needed to build a sustainable business. Building a business is a marathon, not a sprint. We don't have silver bullets. No one does. As I often say, 1M/1M is like a gym membership. Either you use the machines and get in shape, or nothing consequential will happen. We do well with those entrepreneurs who are willing to put in the work, and are realistic about what the outcomes can be. Fifth, some entrepreneurs are over-anxious about confidentiality. Nothing ever gets done because they're so busy being stealth and protecting their ideas. Well, if you really have a great idea that sufficiently challenges the status quo, it will, most likely get rejected and ignored. Not stolen. And if your idea is very easy to steal, then you cannot defend yourself, because sooner or later, you need to be in the market. Idea is necessary, but not sufficient. Strategy and execution are really what drive success. Sixth, entrepreneurs are obsessed with financing. The media hypes up financing. It is an unwelcome message to deliver to an entrepreneur dreaming of millions of investment money that her project is not fundable. Some, not fundable yet. Some, not fundable ever. Many entrepreneurs tune out if you tell them so. We do, regardless. But we also tell them that they can still build the business and either they will have to bootstrap for a while, or forever. And then, we teach them how. Seventh, positioning is a poorly understood discipline. Most entrepreneurs do a poor job. It is one of the key areas where we add value. This is also one of my greatest strengths, so it's been a natural. Eighth, except for a few geographies (Silicon Valley, NYC, Boston), most other seed capital eco-systems are very weak. There are emerging hotspots like Austin, Seattle, Bangalore, London, etc. but it will take the rest of this decade for those eco-systems to really mature such that investors are willing to take on significant risks. In effect, venture capital operates not as risk capital but as growth capital. The entrepreneur has to find ways of financing the high-risk portion of the process. We try to make startups acutely aware of this phenomenon. Also, in those other geographies valuations are terrible. Entrepreneurs end up working for investors pretty soon, unless they are very careful. Ninth, personally, I find it disheartening to see entrepreneurs give up. But they do. Even good ones do. I am still learning to take that in stride, and continue to believe that entrepreneurial energy is like air, water and other essential elements. We need to reduce infant entrepreneur mortality. On the flip side, some people just don't have what it takes. Entrepreneurship is not for everyone. This is also a core reality. Finally, at the end of the day, I believe, intellectual honesty matters. I also observe that the eco-system is inherently dishonest, and mentors, advisors, incubators, media all promise entrepreneurs things that cannot be delivered. We have tried to make 1M/1M a pragmatic, realistic, intellectually honest community - a place where primarily, entrepreneurs can learn. We do not promise the moon. But sometimes, we encounter entrepreneurs who join the program with expectations that cannot be met. To them, our sincere apologies. Since we do not have a screening process, we let everybody in. Equal opportunity, however, doesn't mean equal outcome.